No one who files for bankruptcy actually wants to do it. To some, it can be humiliating and a very hard knock on their self-esteem. Others can keep their heads held high because bankruptcy was the result of a hard-fought battle to keep a business afloat. Whatever the outcome, bankruptcy will have a negative impact on your record that will automatically send many future lenders running for the doors when they see your credit report. That’s the downside we must point out and focus on in this article. But there is light at the end of the tunnel and LoanAway might just be able to help you avoid filing for bankruptcy – OR, if filing really does appear to be your only option, we can help guide you through this difficult time in your life. Whatever the case may be, you will not face it alone. When you’re in the midst of drowning in debt, being able to think straight and make grounded decisions can become very difficult. With all the stress you’re going through, all you can think about is getting relief so you can go to bed/wake up stress-free again. This is why we’ve prepared this guide for you – to help you mull over every option prior to filing. Instead of filing for bankruptcy, securing a debt consolidation loan could be the ideal solution to helping you keep up with your present situation in a way that is much more bearable instead of choosing to declare yourself insolvent and hurting your credit for the next seven years. 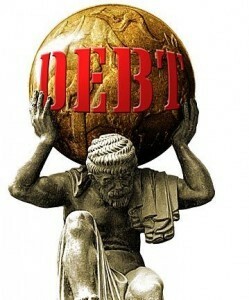 Now we’re going to get into the nuts and bolts of why a debt consolidation loan could bring you a world of relief. If you’re ready to face all your debts head-on and work your way through this difficult period in your life without turning to bankruptcy, LoanAway can start by helping you find a professional bankruptcy trustee who can help guide you through these trying times. You’d be amazed at how a different perspective can be of help when your mind is in a frantic state. At LoanAway, we know exactly what you’re going through and how hard it can be for not only you, but your family as well. We believe in second chances. There are, believe it or not, some hidden benefits to filing. These benefits are largely health-related as you’ll be able to resume a life that doesn’t revolve around constantly thinking about money and how to survive. You can go back to living your regular life again. However, you can reap those same benefits from piling all your credit cards, overdue bills and other outstanding debts and clearing them off in one shot and repay that debt gradually over an extended period of time. Many of our customers opt to repay their debt consolidation loan over a period of 36 months. If you decide that you’d like to do some independent research before speaking with anyone else about your issues, we completely understand. Refer to this resource for an extensive list of questions that are frequently asked by Canadians facing bankruptcy. Once again, if you do choose to go into bankruptcy, it is a huge step to take in your life, but bankruptcy is not the end of your financial life. It will take time for your financial record to re-establish itself, but just remember that thousands upon thousands of Canadians have rebounded over time and put that entire chapter of their lives far behind them. Is bankruptcy affecting impacting how you feel about yourself? Well, in passing we’d like to present you with seven well-known people who’ve bounced back: Abraham Lincoln, Henry Ford, Walt Disney, Milton Hershey (founder of Hershey’s Chocolates), Burt Reynolds, H.J. Heinz and P.T. Barnum. Even the great Ulysses S. Grant and Larry King endured the pains of bankruptcy. So now you see, that if it comes down to it, bankruptcy is just a period in your life. Like these great men in our list, once you’ve settled your issues, you might want to look into starting a business on the side as a way of going from being behind with your finances to being far ahead. Who knows, perhaps that business you build will become as great as what Disney and Ford built.